I was asked recently what is something that has shaped who I am as a teacher. My answer? Arbutus trees. I invite you to come with me to Saanich, British Columbia, a rural municipality outside Victoria on Vancouver Island. I recently returned to Saanich, to the arbutus-filled acreage where I grew up. 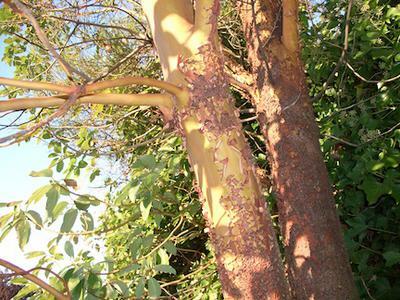 I ran my hand over the smooth bark of an arbutus tree, one still growing on the property, much bigger now than when I was last here. The cool, silky texture of the bark, the look of the knotted and twisting branches, and the patterning created on the leaf-strewn ground beneath the tree evoked some powerful, emotionally-charged images in my mind. Growing up, we used, abused and ultimately adored, the arbutus trees sharing our land. We peeled their bark and - I now shudder to recall - carved messages into their trunks. We also cut some of the trees down, clearing land for our driveway and home, for running trails, using some of their wood for our stove. We had a rope swing attached to the biggest arbutus on the property. It supported our daring swings out over the land below. Under the arbutus trees were the paths we ran, the imposing fortresses we built, the hiding places we felt no one would ever find. I recall being mesmerized by the soft, dancing patterns cast by the sunlight as it streamed through the arbutus branches. The trees offered welcome shade in the afternoons, a canopy of broken light protecting me from the sun’s rays. I often thought that their peeling bark was like my skin after too much time in the sun. By night, the arbutus leaves, on twisted branches created dancing patterns against the darkening sky. My memories. My stories. And yet this particular Place - one that evokes my emotions and imagination - is populated by more than the ghosts of my family and friends. It is storied with the tales of all those that came before- including centrally the Saanich First Nations people who inhabited the land, who walked upon the same earth, who touched the arbutus trees, and who rested in the trees’ patterned shadows. Our Places are haunted - sources of mystery and magic that can be evoked in the telling. My work in Ecological Education has been influenced in no small part by this Place and its gnarly arbutus trees. On this recent visit I brought, for the first time, my two daughters aged 9 and 6. After only one hour in this Place my oldest daughter said, ‘Mom, I feel like there is magic here.’ My girls, like all human beings, are place-makers and are thus constantly making meaning and forming emotional connections to the spaces in which they live. Unlike myself - or my husband - they are not growing up in a rural context. They simply do not have the time to dwell, to play, to imagine worlds, in nature. (For how many children is this now the case?) I fear, moreover, that their learning isn’t supporting the kind of place making that engages them with the natural mystery and wonder immersing them. As an educator I continually ask myself the following question: How can we evoke students’ sense of mystery and wonder about the storied nature of their Place? I believe that evoking the wonder - the magic of our storied landscapes -is part of what we can do as educators to develop ecological understanding.